A case of partial facial atrophy. New York : McDivitt, Campbell & Co., 1876. Publication : The American Psychological journal. Description : v. 3, no. 2 ; frontis., pp. 133-137 ; ill., 2 photo. ; 23 cm. 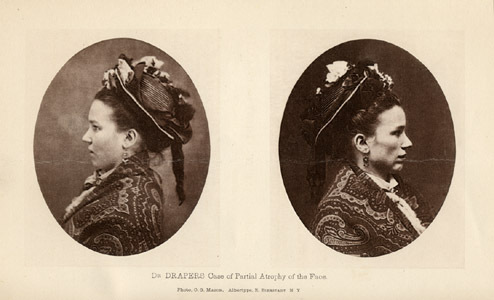 Photographs : frontispiece, albertype — double portrait. Photographer : O. G. Mason. Subject : Face — Atrophy, hypertrophy, and asymmetry of. Report of a case and lecture presented by Draper before the N. Y. Society of Neurology on December 20, 1875. Journal was the organ of the N.Y. Neurological Society, Allan McLane Hamilton, editor. Ceased publication after volume iii, no. 3. Paper wraps, inscribed: Compliments of Dr. Hamilton. W. H. Draper was not related to John William Draper. Draper was attending physician of the New York and the Roosevelt hospitals. Officer of the New York Academy of Medicine. Dr. Allan M. Hamilton was the grandson of Alexander Hamilton. PROSPECTUS FOR 1876 — The Editor takes pleasure in stating that he has secured the co-operation of Mr. Bierstadt, whose art efforts have won for him the high position he now occupies. Mr. Bierstadt was the first to introduce photo-relief-art in this country, and has since perfected the original process of Albert. Mr. Bierstadt will superintend the Art Department of this Journal. Albert-types, copper etchings, and various illustrations of psychological and neurological subjects will be presented hereafter. The New York Neurological Society formed in 1872 and held its meetings at 12 West 31st Street which in 1875 became the first home of the New York Academy of Medicine and its library. Case of an 18 year-old Irish girl, of two years duration at the time of the report and which Dr. Draper called "Trophic Neurosis of the Face." During his lecture Draper discussed other cases of facial hemiatrophy, and credited Romberg with the earliest description of the disorder (1837). However, an earlier case of Caleb H. Parry's was published posthumously in 1825 ("Collections from the unpublished writings..."; London, Underwoods, 1825 ). See also Grasset, Traité pratique des maladies du système nerveux.